I teach and coach leadership to thousands of people each year—at conferences, lunches, events, and workshops, and in one-on-one coaching practice with leaders. And most of the time, the leaders I coach want quick fixes and perfunctory processes to achieve what they want to accomplish. Their true interest often lies in knowing how they can get to their goals more quickly and with less difficulty. But that’s not what growth is all about. What I know from my experience as a leadership coach is that growth comes with struggle and achievement is earned through repeated failures. There’s no way to shortcut the experience that doesn’t also shortchange the outcome. The most valuable things in life aren’t the ones that come easily. To be a truly meaningful leader you have to embrace struggle and make failure part of your success story. Here are some of the ways failure is valuable and why it’s at the heart of most success stories. Failure teaches wisdom. Success feels good, but failure—as long as you don’t let it get the best of you—brings wisdom and growth. Leaders who have failed have a depth of understanding that can’t be obtained any other way. Failure breeds resiliency. Nothing in life creates resiliency like struggle and failure. Persistence and resilience come from working through difficult problems and still finding the will to keep going and take chances. Failure stretches potential. Until you’re tested, it’s hard to imagine being able to endure struggle. But failure, when it comes, can take you far beyond the limits you imagined for yourself. Every failure is an opportunity to rethink your own limits and realize how much stronger and more capable you are than you ever thought. Failure provides opportunities. Our natural impulse is to shy away from failure—nobody wants to take on a struggle—but when you eliminate adversity, you limit your potential. Failure provides you with additional resources and preparation to take advantage of the opportunities that come your way. Failure supplies motivation. Nothing else is as motivating as struggle. I’ve seen it many times over as a coach: defeat motivates people to concentrate harder, focus better and achieve more. Failure generates benefits. It may be hard to see when you’re feeling stuck in failure, but with the benefit of a little time and distance, you’ll be able to discover the benefits and the value of struggle. It’s a matter of looking at events through the lens of your eventual success. Lead from within: If you pursue success, welcome failure, hold on to hope and never lose your perspective, you’ll find there is something positive in every negative experience. The post This is Why Failure Makes You a Better Leader appeared first on Lolly Daskal. Every leader will face struggles, but some struggles are common enough that you can learn from the bad experiences of others and avoid the trouble and risk of taking them on yourself. Here are six top struggles leaders are guaranteed to face work to avoid them. Not doing the right thing. If you don’t lead with character, struggle is practically guaranteed. Character in leadership means consistently doing the right thing and the best thing. It plays a major role in your ability to lead and influence. Great character is molded into great leadership. Leading through demands and control. Leaders lose respect when they have to rely on demands and control—and losing respect is fatal to leadership. Leaders may try to demand respect and control outcomes. But respect is earned, not demanded, and outcomes are outside your control. Let go; learn to lead with vision and trust that the outcomes will be positive the long run. Relying on unclear messages. If you aren’t a good communicator, serious struggle is more likely to occur. Just as most people think they’re good drivers, most leaders think of themselves as great communicators—but as an executive leadership coach I often see leaders who think they are communicating brilliantly when no one around them has a clue what they’re trying to say. Work on your communication skills to make sure you keep your messages clear and compelling. Trying to persuade without inspiring. No matter how strong your vision is, if you lack the ability to inspire and motivate others you’re not going to connect. The difference between motivation and inspiration is that motivation must constantly be renewed, while inspiration lasts a lifetime. Great leaders instill both. Refusing to delegate. Most leaders—if not all—think they can always do everything better themselves, and as a result they have a hard time delegating. But refusing to delegate turns you into a micromanager and erodes trust in your leadership, which leads to constant struggle. Learn how to delegate the right task to the right person and then maintain the right level of involvement. Giving in to self-doubt. They may or may not ever express it, but from time to time every leader asks themselves, “Am I measuring up?” If the answer is no, it’s likely a matter of self-doubt or lost confidence. Comparisons to others is a quick way to derail leadership. Refuse to measure yourself against anything but your own goals and expectations. Lead From Within: Avoid struggle when you can, and learn to face the unavoidable struggles with confidence. The lessons we learn from struggles—our own or those of others—lead to true progress and growth. 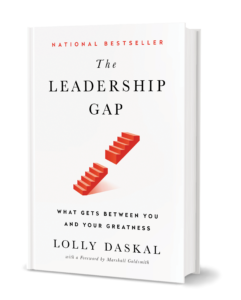 The post 6 Struggles Every Leader is Guaranteed to Face appeared first on Lolly Daskal. 1. Mistakes are not a problem, but not taking the opportunity to learn from them is. Identify your mistakes and learn from them quickly. Many successful people have experienced some kind of failure–and they build on those lessons. Learning to fail well means learning to understand your mistakes. In every mistake there is a potential for growth. 2. Be careful how you talk to yourself, because you are listening. Self-talk can be incredibly damaging, especially after a failure. Handle your self-talk and don’t allow it to make you feel worthless–especially in the aftermath of a failure. Let it sting for a moment, and then do everything you can to stay positive and get back on track. 3. It’s far better to do something imperfectly than to do nothing perfectly. The only true failure is doing nothing–inaction puts everything at risk. When we do nothing, it means we are not moving anywhere. And that is a surefire way to stay in failure. All that is required for failure to triumph is for us to do nothing. 4. We are products of our past, but we don’t have to let our mistakes define us. Even if the past did not go as we had hoped, our future can still be better than we can envision. Too often, we’re afraid to talk about our past and our failures out of fear that they’ll define us. Let it out, but stay focused on what’s ahead. 5. The enemy of success is fear of failure. It’s not failure itself that’s so dangerous–it’s the fear of failure that keeps us doing nothing. Like all fears, you conquer it by facing it down. And when the fear of doing nothing exceeds the fear of doing it wrong, that is when your true work begins. 6. Consistent action creates consistent results. Strength doesn’t come from what you can do, it comes from mastering the things you once thought you couldn’t do. So let yourself fall down, but learn to dust yourself off and get up and move forward. What you do every day matters more than what you do every once in a while. Consistency is key to success. 7. You can’t do it alone–and you don’t have to. Sometimes our failures keep us stuck in our old ways and we need support to help us get past our bad habits. The worst thing we can do is think we need to handle this alone. Find a coach, a mentor, or a friend who supports you in your efforts and has the experience to get you pointed toward your own success. The post 7 Powerful Ways to Turn Every Failure Into Success appeared first on Lolly Daskal.